Recall from lecture: A Java program must be compiled, or translated into binary instructions. Then it can be executed or run. When you run a program, it displays output messages to the user in a text window called a console. For this exercise, let's compile and run a short program that we will provide to you. (See the following slides.) If you get stuck, ask a classmate or TA for help. 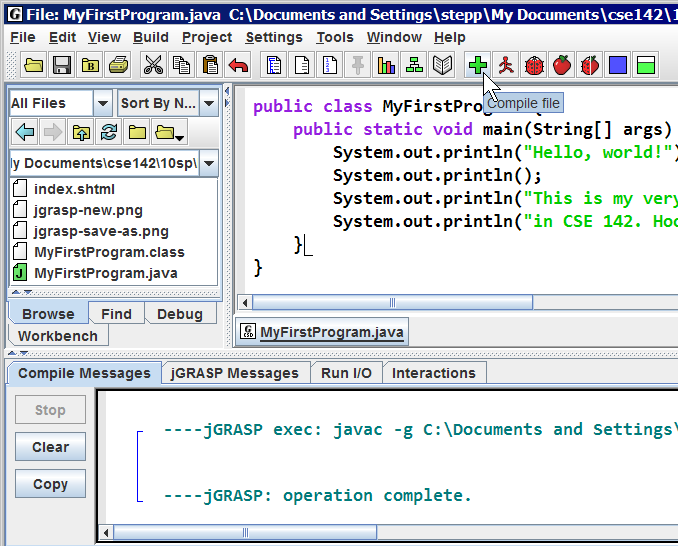 Run the jGRASP editor from the Start Menu of the lab computer (or run it from your own laptop, if you brought one). 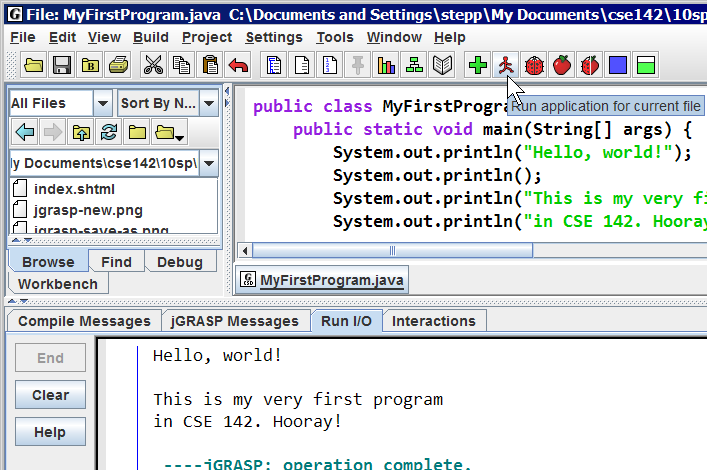 In jGRASP, create a new Java program: Click File → New → Java from the top menu. An empty white text window should appear in jGRASP. Save the program: Click the Save toolbar button, or click File → Save from the top menu, or press the hotkey Ctrl-S (Command-S on a Mac). The file name must end with .java and must match the 'public class' name from the Java program. Name this file MyFirstProgram.java. Compile the program (translate it to binary instructions): Press the toolbar button that looks like a green plus (+) sign. Or press hotkey Ctrl-B. You should see "jGRASP: operation complete". Run the program: Press the toolbar button that looks like a running man. Or press hotkey Ctrl-R. You should see the program's output in the bottom console area. Modify your MyFirstProgram file to produce the following console output. Note the blank lines; you should include those in your output. I am learning to program in Java. I hope it is a lot of fun! I hope I get a good grade! Maybe I'll change my major to computer science. In CSE 142 you'll use a web turnin system for your homework. Let's practice turning in a file by submitting your MyFirstProgram.java. Go to the CSE 142 Labs web page. Click the link that says "Turnin Page for turnin exercise." Log in to the page and input your personal information. Browse to your MyFirstProgram.java file and submit it. Part of your homework grades come from producing correct output exactly. Use our Output Comparison Tool web page to check if your output is correct. Go to the CSE 142 Labs page. Click the "Output Comparison Tool link." Select MyFirstProgram from the list. The expected output should appear. Go back to your program. Run it and copy/paste its output from jGRASP's console into the "Actual Output" box of the web page. Click Compare on the page. Does your output match? If not, fix the program and try again. If you had to fix any output, turn in the program again. Make sure that your MyFirstProgram program has good indentation. Our Indenter Tool web page can fix a program's indentation. Go to the CSE 142 Labs page. Under Lab 1, click Indenter Tool. Copy/paste the Icky.java code into the Indenter's text box. Paste the properly indented code in the box below. Exercise : What's the output? How many lines of output are produced (including blank lines)? Answer: 6 lines. The blank lines in the code don't count, but the System.out.println(); statements do. The following program contains 11 errors! Work with a partner to find them all. You may want to run the program and jGRASP and see what kinds of error messages are shown for each kind of mistake. Once you think you've found the errors, create/compile/run a corrected version of this program. line 4: ? should be before "
line 7: missing ) after "
Discover what error messages the compiler produces when you make each of the following mistakes. How many unique error messages are you able to cause the compiler to produce? Naming your file incorrectly, then compiling. Forgetting a quotation mark "
Notice that the error messages don't always make it obvious what is wrong. But they usually tell you the right line number to fix. An escape sequence inserts a special character into a println statement. What output is produced by the following code? (Try to figure it out without running the code. Note: when you see a purple check mark as in the upper-right corner of this page, that means that this problem is also available in PracticeIt by clicking on the check mark. The string "" is an empty message. the rules of "escape sequences." Also, "" represents an empty String. Don't forget: use \" instead of " !
'' is not the same as "